The decision was made late Monday night, and the word came out early Tuesday morning that Wyoming defensive coordinator Chris Tormey was fired. I am not surprised this was done, but I didn’t think it would happen now. Christensen hasn’t been a guy that has fired coaches during the season since he’s been at UW. But if there was a time to do it, perhaps it was now since the Cowboys don’t have a game this week. This is the eighth of a season-long series of video interviews with University of Wyoming football coaches, and how they teach and coach certain aspects of the game. This one features defensive coordinator and safeties coach Chris Tormey. Tormey has safeties Darrenn White, Xavier Lewis, Tim Kamana and B.J. Hendrix go through some drills, and also features graduate assistant Dwain Crawford. 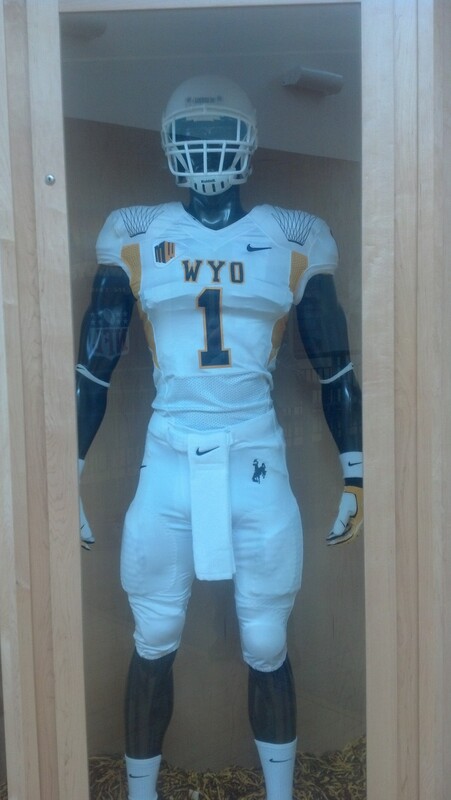 Check back to this blog wyosports.net on week’s Wyoming has a game for this feature. Wyoming defensive coordinator Chris Tormey talks about the defense’s struggles in last week’s 42-21 loss at Texas State and the first of two bye weeks for the Cowboys this week during this interview done on Monday, Sept. 30, 2013 in Laramie, Wyo. Can Wyoming’s defense improve after last week’s game? See WyoSports senior editor Robert Gagliardi’s column in Thursday’s Wyoming Tribune Eagle and Laramie Boomerang, and at wyosports.net. For the first time this season Wyoming’s offense was not balanced, and the results showed in a 42-21 loss at Texas State last Saturday. There were other factors on defense that led to the loss, too, but I will address those later. UW had a season-low 64 yards rushing, compared to 292 yards passing. It also ran 29 run plays and 48 pass plays. Texas State’s defense had a lot to do with that, and also the fact UW trailed by double-digits much of the second half and needed to throw the ball to try and get back into the game. Quotes and comments from the University of Wyoming’s 42-21 loss at Texas State Saturday night. — “Pathetic.” — from @MarkMstacy via Twitter. — “Refs, weather and not much effort. Doesn’t look good for (the) Pokes tonight.” — from @johnywyo via Twitter. — “Wow. Wyoming getting butts whipped with ZERO effort.” — from @beaufodacious via Twitter. — “You should write a ‘choose your own journey’ story about what you think will happen in this game and publish it.” — from @WyoNationDotCom during the 3 hour, 28 minute weather delay. Wyoming defensive coordinator Chris Tormey talks about the challenges for his defense this week heading into its Mountain West opener at Air Force, and also the challenges of his defense being on the field more this season based on the team’s faster-paced offense. The interview was done on Monday, Sept. 16, 2013 in Laramie, Wyo. Read Wednesday’s Wyoming Tribune Eagle and Laramie Boomerang, and log on to wyosports.net, for how UW’s fast-paced offense could be putting more pressure on the defense. There was rain early and late. But it didn’t stop the Wyoming football team from practicing outside at Jonah Field at War Memorial Stadium Tuesday morning. “There was no lightning and we have to play in it,” coach Dave Christensen said. UW does not have a game on its schedule this season indoors, and it played a little bit in the rain in last Saturday’s 42-10 home win over Idaho. The forecast for Saturday’s home game with Northern Colorado calls for a 30 percent chance of thunderstorms, with a high of 67 degrees. –Sophomore center Rafe Kiely split reps with the No. 1 offense with junior starter Albert Perez. Redshirt freshman guard Chase Roullier took most of the snaps at left guard for senior Tyler Strong, who was in a red, no contact jersey. Perez and Strong are expected to start against Northern Colorado. Wyoming defensive coordinator Chris Tormey talks about trying to stop No. 18 Nebraska’s offense in Saturday’s season-opener at 6 tonight in Lincoln, Neb. Join WyoSports senior editor Robert Gagliardi for a live chat for the game, starting at 5:30 p.m. 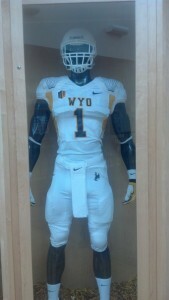 Check the blog and wyosports.net for the link.